"They say blue is the color of the sky, the sea, the blue whale. Sounds simple, right? But this observant little girl knows the world offers all kinds of hidden truths and intriguing surprises, if only you pay attention and look." Jillian Tamaki is an illustrator and comics artist best known for her graphic novels Skim, which was named a New York Times Best Illustrated, and This One Summer, both cocreated with Mariko Tamaki. This One Summer was awarded a Caldecott Honor, Printz Honor, and Eisner Award. "The free-association nature of the child narrator’s interaction with her surroundings seems utterly familiar, and approaching it with observational, sensory language lands it firmly in territory children can relate to. This poetic, off-kilter little book has enigmatic power, and observant children will likely be enchanted." "Thinking, imagining, noticing—these, Tamaki suggests, are the tools we have to understand our world." "Attuned to a child’s psychology and patterns of critical thinking, this visually stunning work is a must-purchase for libraries." "A reminder to slow down, savor the present, notice small details, and relish childlike wonder." 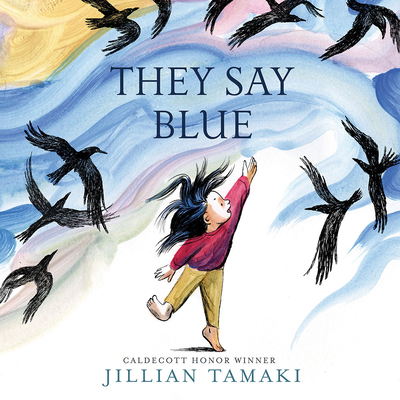 "Award-winning illustrator Jillian Tamaki covers her pages with colors, textures, meaning, and form that will allow the reader to explore and experience emotion along with the young girl."